– for action, some peril and mild rude humor. 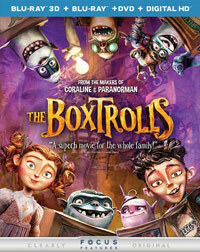 THE BOXTROLLS is a 2014 animated fantasy-comedy film based on the novel “Here Be Monsters!” by Alan Snow. The movie follows the adventures of Eggs, a human boy raised by trash-collecting trolls, as he attempts to save them from Archibald Snatcher, a pest exterminator. Released last month to generally positive reviews, THE BOXTROLLS has generated over $46M thus far at the U.S. Box Office. We will position the home entertainment release as an entertaining, energetic, Dove-approved family film with a strong moral worldview that teaches positive lessons about doing the right thing and judging people by their “gentle and quiet spirit” as opposed to their outer appearance. While the dialogue includes valuable discussion of “good versus evil,” the film does contain some edgy content that makes it problematic for viewers under 10-12. It is, however, funny, clever, exciting, and sometimes even profound, and we can recommend it to families across the denominational spectrum. Stop-motion animation is a fascinating artform. The Boxtrolls had been in production for some time, and the animation team behind it spent years creating the project by hand (and even started promoting it with theatrical trailers over a year before it released. Thousands of puppets with movable parts and even removable facial expressions were created to make the stop-motion characters come to life. 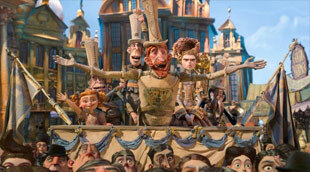 In the past, many films exclusively used clay forms to make these characters, but Boxtrolls was realized by way of little figurines, and the resulting effect is quite impressive. If one didn’t know any better, from the look and even the world that The Boxtrolls seems to be based in, you might think they this is a Tim Burton flick (like Corpse Bride). The world of The Boxtrolls is dark and a little ugly — in the sense that things are rather twisted and not really made to look appealing. The style is a bit gothic and edgy. And that’s the vibe that the film fully subscribes to. The plot revolves around a high society group of “white hats” that a creepy guy named Archibald Snatcher wants to become part of. The white hats are obsessed with cheese too, something that certainly attracts Snatcher as well, but before they can let the “red hats” leader into their group, Lord Portley-Rind makes a deal with Snatcher: he must rid the town of the most feared and hated boxtrolls! The town believes them to be vile baby-snatchers and they live in great fear of the little mysterious creatures. 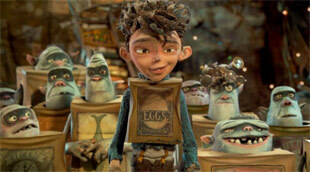 But in truth, the boxtrolls are music-loving kleptomaniacs who mean harm to no one. Over the next ten years, they end up raising a human as a boxtroll, named Eggs (after the box he wears), all while Snatcher–and his team of morality-confused red hat wearing henchmen–continue to kidnap, and presumably kill, boxtrolls. Finally, Eggs is discovered by a little girl named Winnie, and once his boxtroll father-figure Fish is taken, decides to team with Winnie to try to find and recover his troll friends. The whole premise alone is rather dark. The story makes no bones about Snatcher erraticating the little creatures, and the villain’s henchmen are about as ruthless as he. Also, at one point, we learn that Snatcher has an intense allergy to the cheese he loves so much, and his face swells up in a grotesque manner. In the finale, Snatcher is so deformed and disgusting that it’s sure to gross out some viewers. And not to spoil one of the last scenes, but there’s a surprisingly graphic moment where Snatcher eats a small piece of cheese while already so swollen and deformed… and he literally explodes in a powder ball of yellow yuck. It’s sudden, unexpected, and likely to churn the stomach of more than one viewer. 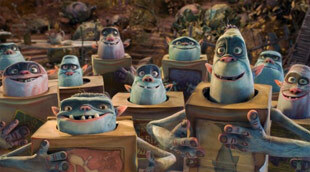 As far as the slaughtering of innocent boxtrolls over a ten-year period–again, at the risk of spoiling the story (so don’t read on if that concerns you)–we do later find out that they were all kept alive to tinker on a gigantic robot Snatcher was making to use to dominate the town. In one fell swoop, we think he actually does smash all of the remaining boxtrolls, but we find out they escaped at the last possible moment. Aside from the overtly dark nature of the film, the pacing is a bit of a problem at times. While setting up the story, the camera tends to linger on moments longer than it needs to, making some scenes strain towards boredom, but when you consider the craft of the how the film was made, it makes perfect sense why the filmmakers would want to linger on scenes that took weeks or months to create, set up, and film. If you stop to marvel at the visuals, it really is impressive. But as a story, it tends to lack at times. And the gross-out moments just don’t help either. Aside from the aforementioned Snatcher moments, the film revels in showing the trolls–and Eggs–eating live grub bugs, centipedes and beetles. It’s pretty disgusting to even think about. Also, the dialog includes some graphic images pertaining to the fabled (and erroneous) horror stories about the boxtrolls. Especially Winnie is heard talking about rivers of blood and the bones of victims and intestines being spilled, etc. None of this is shown, but it’s gruesome word pictures for sure. Another weird content thing to make note of is that there’s an entertainer named Madame Frou Frou who the married Lord Portley-Rind is attracted to, and flirts a lot with. Later, we find out it’s a man in disguise as a woman, leading Lord Portley-Rind to remark, “Oh my G-d! I regret so much.” The man is then seen dressed in drag several times and it’s a little creepy. As far as language goes, in addition to that use of God’s name is one “Good Lord!” and then one incomplete use of “Oh Sh–” (said just like that) before a character is crushed to death. The most redeemable aspect of the film is probably the strong family theme. While the traditional family structure isn’t really shown in a positive light, the strong bond between Eggs and his boxtroll family is heartwarming. Winnie is sadly neglected by her father, Lord Portley-Rind, and the definition she tells Eggs of what a father is is a bit too idealistic–and sad, given that her father really doesn’t seem to care about much besides social standing…and cheese. The final moments of the movie are positive, but the journey getting to that point is grittier than one might expect from an animated family film. Also, the voice cast is quite impressive, even though almost none of the voice talents are recognizable in their roles. For example, Ben Kingsley is Snatcher and Tracy Morgan is Mr. Gristle, and you’d never guess it. However, the acting is done very well regardless. Overall, like most of the edgier animated ventures–like Corpse Bride, ParaNorman, Igor–they’re not just an acquired taste, they’re limiting given the gloomy nature and sometimes frightening or even disturbing visuals. While The Boxtrolls is certainly an achievement in animation and impressive when you consider what they’ve accomplished, it lacks on several fronts (including pacing and story), and probably won’t become a must-see classic for your family in the long run. You’re really better off checking out the more enjoyable The LEGO Movie or Penguins of Madagascar. The Boxtrolls is available in a Blu-Ray/DVD 2-disc combo pack, a 3D Blu-Ray/2D Blu-Ray/DVD 2-disc combo pack or as a single-disc DVD (and through the usual digital services). The Blu-Ray disc has a few bonus features while the feature film looks really, really vibrant and crisp in HD. The 3D Blu-Ray disc actually contains the 3D and 2D presentation on the same disc. But you will need the right player and TV and such to watch it in 3D. Preliminary Animatic Sequences (17:29) – These are hand-drawn storyboards of the scenes as they would eventually be animated in stop-motion form. It’s very early animation without a lot of details that works as reference for the animators. Sequences include: “Baby in the Trash,” “Eggs in the Underworld,” “Man on a Horse,” “Trubshaw’s Inventorium,” “Cheese Shop,” and “Tea and Cheese.” Some of it includes deleted ideas and concepts from the finished animation. Dare to Believe: Behind the Scenes (32:48) – This is a five-part making-of featurette. “Voicing the Boxtrolls” starts things out, highlighting each member of the primary voice cast, and we get to hear a little bit from each one as they talk about their respective roles. “Inside the Box” focuses on the tech that’s inside the puppet boxes. The filmmakers talk about planning out how the trolls can fit inside their boxes and animating stuff like half of their heads peeking out and their illuminated eyes. It’s pretty impressive to see how they came up with a solution! “Allergy Snatcher” shows how they accomplished the look of Snatcher with his face swollen, and how they could animate that traditionally. They planned it out first on a computer with digital effects and then printed out the different pieces of his face using a 3D printer. “Deconstructing the Dance” shows how they made the dance sequence come to life. First, they choreographed it out using real dancers and filmed it as a reference. They then used stop-motion animation for the main characters and filled in the others with computer graphics. Finally, “Think Big: The Mecha Drill” focuses on how they created the huge, animated robot for the film’s finale. We find out that they even filmed a stop-motion fire effect and displayed it on an iPad Mini which they built into the robot! Featurettes (13:00) — There are five featurettes that you can watch individually or together with a Play All option. These all play out like extended commercials, all roughly three minutes in length. The first one, “The Nature of Creation,” focuses on the little natural elements they had to create for the movie – like plants and flowers and fire and smoke. “Trolls Right Off the Tongue” is a lot like the segment from the earlier behind-the-scenes featurette and talks more about the language, and its sound, of the boxtrolls. “Allergic To Easy” is all about Snatcher’s allergic reaction scenes again, while “Let’s Dance” is about the dance scene and “On The Shoulders of Giants” is about the mecha-drill again. These don’t add a whole lot of new details or footage from the other featurette, but there definitely is some.